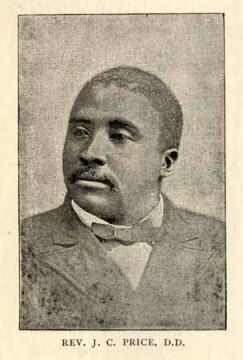 On February 10, 1854, African American orator and teacher, Joseph C. Price was born in Elizabeth City. In 1863 his family moved to New Bern where he was enrolled in St. Andrew’s School. Price, though late in beginning his formal education, made exceptional progress. After completing his own education, he taught in Wilson, becoming the principal at a school there in 1871, but within a few years he returned to school to prepare for the ministry in the A.M.E. Zion Church. In 1881 Price distinguished himself as an orator, speaking on prohibition and later on education and race issues. On a speaking tour in Europe, Price raised nearly $10,000 to establish a college for blacks in North Carolina. With the additional support of Salisbury residents, he became president of Zion Wesley College (now Livingstone College) in 1882. Price gained national attention while there. In 1890 he was elected president of the Afro-American League and the National Equal Rights Association. Price’s promising life ended abruptly in 1893 after he contracted Bright’s disease, a disease affecting the kidneys. He was buried in a mausoleum on the campus of Livingstone College.